US-backed Venezuelan opposition leader, Juan Guaido, came to Caracas seeking to be arrested, but the provocation failed and he ended up being guarded by police from an angry mob, investigative journalist Max Blumenthal told RT. “It’s ironic to see government security forces actually protecting Guaido, a figure who is calling for the government to be toppled and attempting to fragment the security services from within,” Blumenthal, editor of the Grayzone Project, said, commenting on the video recently uploaded to social media. 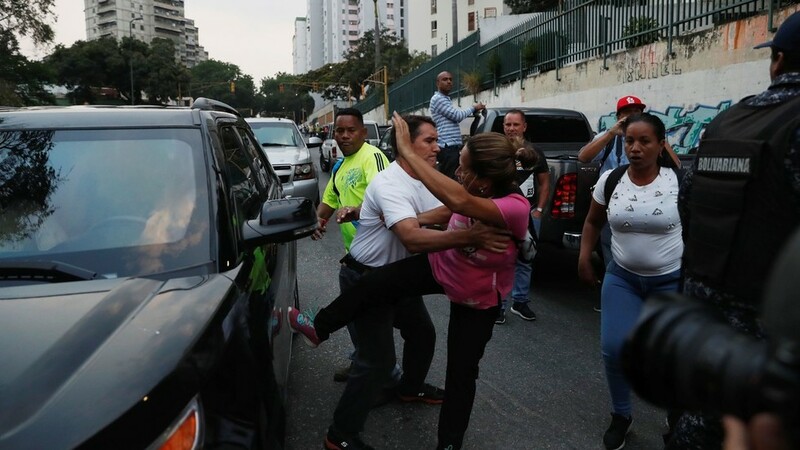 The clip showed people in the working-class neighborhood of El Valle in Caracas hurling insults and trying to make their way to a black SUV, which was reportedly transporting Guaido to a rally. Only the police officers, loyal to President Nicolas Maduro, were there to protect the opposition figure. “It’s also ironic because we constantly hear about Venezuela as some kind of ruthless Communist dictatorship. But here you have a situation that will certainly not be tolerated in the US or other countries, like Russia, China or Germany… What kind of dictatorship is this? Well, apparently it’s not a very effective one,” the journalist said. President Maduro is, of course, not without blame, as “mistakes were made by the government… but now they’re in a position when the US is trying to prevent them from getting out of the hyperinflation… and preventing them from importing food and medicine,” the journalist explained. The harsh sanctions imposed by the Trump administration on Venezuela constitute “financial terrorism and it’s an attack on everyone, regardless of their political affiliation. I think Venezuelans recognized that,” and therefore have no desire to back Washington’s man, Guaido, Blumenthal believes. Previous PostThe Top Ten Players In American Media’s Failed CoupNext PostUS-puppet Guaidó begged for protests, but nobody turned up!